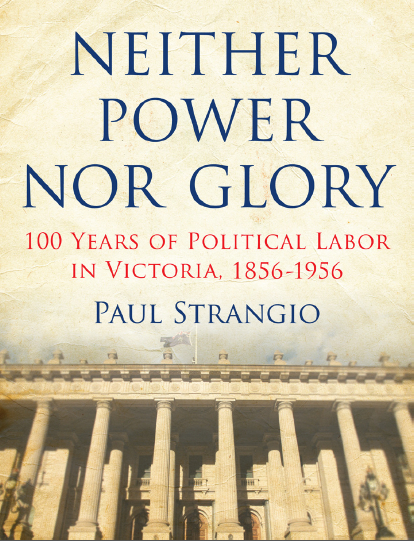 Paul Strangio’s new book Neither Power Nor Glory: 100 Years of Political Labor in Victoria, 1856-1956 (Melbourne University Press, 2012) is being launched on Thursday 7 June by the Hon John Cain at Embiggen Books, 197-203 Little Lonsdale Street, Melbourne (opposite the Wheeler Centre). 6 for 6.30 pm. RSVP’s essential. Please contact Embiggen Books on (+61 3) 9662 2062 or 9342 0300. Light refreshments will be provided. Paul is a senior lecturer at Monash University. He has been a frequent commentator on Australian politics in the print and electronic media, including contributing many op/ed pieces to the Melbourne Age and an election commentator on ABC radio 774 Melbourne.